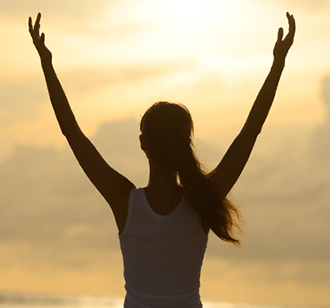 Use these tips and hypnosis techniqeus to set yourself free from low self-esteem and achieve the healthy body that you deserve. Low self esteem often goes hand in hand with weight problems. The reasons can be varied and complex, but people with low self esteem often use food to comfort themselves, and can find it harder to stay motivated. Here are a few ways to give your confidence a boost, which can naturally help you to confidently achieve a healthy body. Many people with low self esteem have difficulties or episodes in their childhood that have led them to feel a lack of confidence. Feelings of self-worth are formed through our learned experiences as we grow, so if you weren’t encouraged to love and respect yourself as a child, then you may experience low self-esteem as an adult. Work on letting go of any negative feelings towards those who may have contributed to your low self-esteem. Make a vow to yourself to achieve your goals in spite of any difficulties in your past. A great way to boost your self-esteem is to think about your achievements, and to congratulate yourself for them. If you are a good parent, do charity work, or have had success at work, give yourself a pat on the back. Smaller achievements, such as helping a friend, cooking a great healthy meal, or getting a long list of chores completed, may seem commonplace, but are achievements nonetheless. Recognise your own accomplishments every day. We can all make improvements to our bodies, through diet, exercise and sleep, but no one is perfect! Practise gratitude for the way that your body works, and focus on one thing that you like about your appearance every day. Practise positivity by turning any negative thoughts about your appearance into positive ones. As a small example, if you are bothered by wrinkles around your eyes, remember that they are caused by smiling, and recognise how attractive happy, laughing people are! In today’s world, we are bombarded with images of unachievable, unrealistic bodies; bodies that have been manipulated with editing software that removes wrinkles, blemishes and even pores! With the steady drip-feed of these images in society, it’s easy to forget that the models and celebrities pictured are human, just like us, and are likely to have as many physical ‘flaws’ as everyone else. The ‘size zero’ trend without doubt, is not a healthy one. Muscle weighs more than fat, so losing weight in order to become thin is an unhealthy goal. Fitness comes from strengthening your body through diet and exercise, and is not just about losing weight. When you become fitter, confidence and health naturally follow. Think of your journey as a way to become fit, not thin. By changing the way that you think about yourself, you will find it much easier to reach and maintain your goal weight. Just as importantly, your mental attitude will be much healthier, as you learn to respect and appreciate how strong, talented and unique you are. Nothing can stop you now! You may like to order my Weight Loss Hypnosis MP3 & eBook Offer, which is filled with more great tips, techniques, positive suggestions and affirmations. 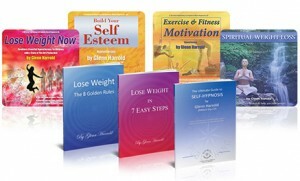 This special offer, exclusive to www.hypnosis-download.co.uk will help you lose weight, get fit and feel great.